The fuel filter isn’t a typical part many think about when it comes to their vehicle. It’s just one small component of a vehicle’s fuel system. However, it plays a considerable role and should be looked at more closely. Fuel filters are found on almost every internal combustion engine. The fuel system filter can be located under your car fitted on the gas line. They feature a filter paper inside that removes contaminants from your gasoline. The fuel filter’s job is to remove pollutants before they make their way to your vehicle’s engine. While it might not look like a big job, it is. The fuel filter can be compared to your car’s air filter. In a sense, it screens what is going into your engine. For the best performance of your car’s engine both need to be free of dirt, debris, and other contaminants. An engine’s performance relies on the clean gasoline. The cleaner the gas the more efficient it will burn. 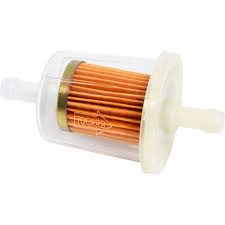 Why and When You Should Replace Your Fuel Filter? Over time, a fuel filter can become clogged, extremely dirty, or become faulty. When a filter is clogged, it restricts the flow of gasoline to your vehicle’s engine. So it’s necessary to have it replaced. But how does a fuel filter become faulty? Whenever you fill up your gas tank, you are allowing outside particles to get into the fuel system. Paint chips are a commonly found particle in fuel filters because of paints proximity to the where you insert the gas nozzle. Another known containment is rust. Rust is horrible on engines but is a known problem for any vehicle that is exposed to moisture and has steel parts. If these particles make their way through the fuel system, they can cause some significant issues. The most notable ones being clogged fuel injectors or damaging the fuel pump. It is best to replace a fuel filter so damage won’t be done to these more expensive components of your fuel system. When should you replace your fuel filter? There are many signs it could be time to replace the fuel filter. The easiest sign to identify is if your car has trouble starting and has a rough idle. Other signs could be an engine dies while idling, shakier engine, and a vehicle that struggles at slower speeds. It is best not to wait if you are noticing any of these signs. A pretty good indication that your fuel system is working correctly with a good chance the fuel filter is the culprit. The recommendation for vehicles is to have their fuel filter changed at a somewhat regular interval. If you suspect your car has a faulty fuel filter, Ryan GMW can help! Maintaining a clean fuel filter can ensure your other fuel system parts will remain in good working order. Previous PostPrevious Is it Time to Replace Your Car’s Battery? Next PostNext What Happens During a Brake Inspection?